Head wraps are a fabulous way to keep your hair back when you’re lying on the beach, by the pool, or whenever you need to spice up your outfit! 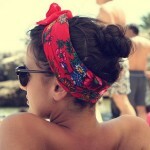 The patterns and styles are endless, but we love this knotted head wrap look. For more inspired looks check out all our trend reports; or ask your stylist the best way to wear your hair at your next appointment!